No one can deny that the American soprano Maria Ewing has courage. At the age of sixty, after an absence of more than five years, she appeared again on the opera stage this weekend in a role she had always wanted to sing. 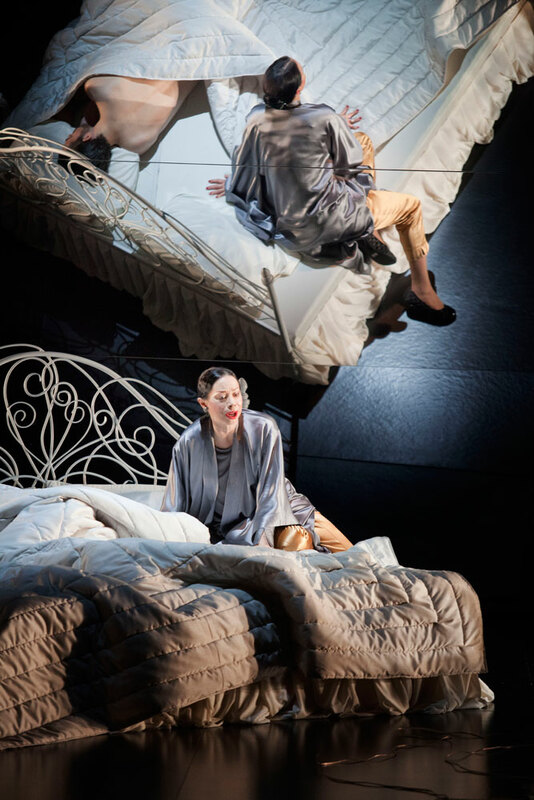 It was Guus Mostart of the National Reisopera who had been able to fulfil Ewing’s wish, and so it was that Poulenc’s one-act opera ‘La voix humaine’ was premièred in Enschede on Saturday evening, with Ewing in the one and only role of ‘Elle’. The Reisopera coupled the sombre and mysterious drama about a woman on the phone to the loved one who has left her with Ravel’s witty and racy one-act opera ‘L’heure espagnole’. Mostart invited the director Laurence Dale for a trait d’unionbetween these so-different worlds. 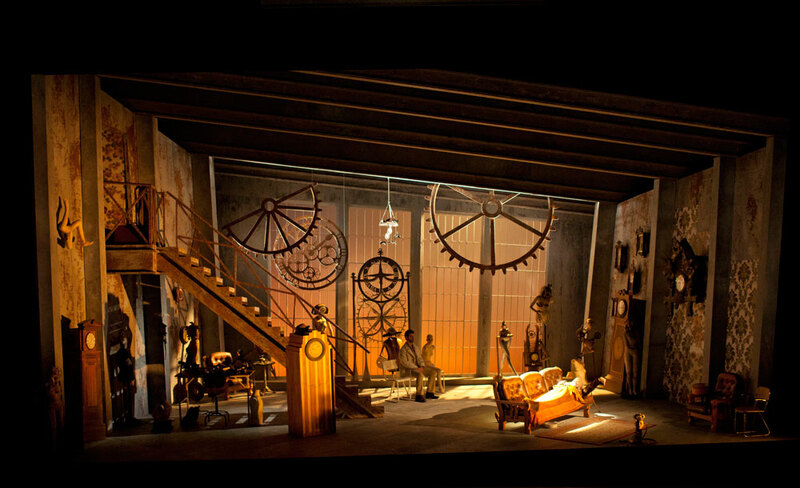 You might perhaps have expected him to make the telephone from Poulenc’s opera reappear among the household goods of the clockmaker in Ravel’s work, but good theatre is never as easy as that and certainly not with someone like Dale. He had thought of a more surprising method of binding the mini-operas loosely together. That ‘method’ was called Craig Verm, an American baritone whose bulging biceps suggested he had just left a martial arts academy and who carried the heavy grandfather clocks fervently and convincingly up and down the stairs in ‘L’heure espagnole’, becoming ever more sweat-drenched and naked in the process. This ‘randy’ Ramiro turned out to be the same man who, at Dale’s direction, turned up unexpectedly between the sheets of the woman on the telephone in ‘La voix humaine’. Many directors find the telephone to be an impediment. So does Dale, who quickly leaves the instrument alone and allows the woman to exist between desperation and reality in a room with a slanting mirror as a ceiling. In that desperation she sees her absconded lover – or is it someone else? The opening tableau is beautiful. A spotlight illuminates Ewing, lying on the ground with outstretched arm. The ceiling mirror turns her into someone who might have been crucified. Maria Ewing’s voice isn’t completely gone but the heavy (sometimes too-heavy) roles have taken their toll. She forces her way through this never-tender role with a woman’s courage, can often be heard gasping for breath, and has difficulty with high notes and the end of phrases. Despite that, here is someone who is totally believable, a woman broken down in every respect. Hats off to her! After that, things turned deliciously banal in Ravel’s opera. Concepción, the clockmaker’s wife, has two goofy lovers. They have to keep hiding in clocks, which Ramiro then hauls to and from her bedroom. Finally, Concepción realises that the juicily-muscled man is a much better catch. With time-honoured theatrical tricks (bloke gets into clock and then, unseen by audience, vanishes into scenery) Dale manages to get the auditorium laughing happily. 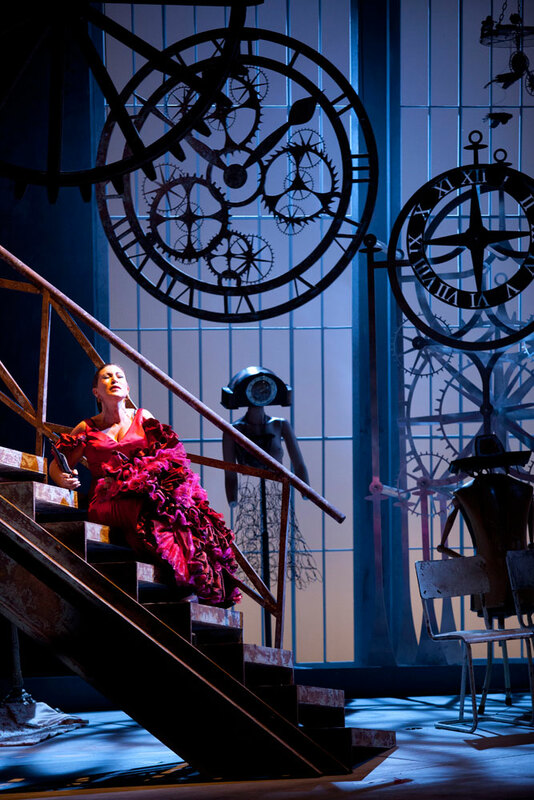 When Ramiro pushes an extremely heavy clock up the stairs for the umpteenth time he even gets a curtain call – does the audience really think there’s still a man inside the clock? Concepción is played magnificently by the French singer Marie-Ange Todorovitch; she has both her heart and her vocal cords in the right place. She is splendidly intelligible, sings with infectious ease and, as an actress, is also the radiant centre-point on stage. Around her, the tenor Erik Slik is particularly noteworthy as Gonzalve but this staging of Ravel is, above all, a true ensemble piece that runs like clockwork. From the pit, the Orchestra of the East, under the direction of the talented Patrick Davin, provides fantastic counteraction to the melancholy diva and the merry ensemble. An intriguing evening! The French one-act operas ‘La voix humaine’ by Francis Poulenc and ‘L’heure espagnole’ by Maurice Ravel, both from the previous century, have women in the title role. The similarities stop there: the atmosphere of the works differs enormously. La voix humaine, to a text by Jean Cocteau, is a lyrical tragedy in which a woman (Elle) has a telephone conversation with her ‘ex’. Her mood changes from nonchalant to sweet, desperate and hysterical. In the end it becomes clear that her ‘ex’ is not on the other end of the phone and perhaps never has been. L’heure espagnole, after a play by Franc-Nohain, is a comedy with a high burlesque content. The main character, Concepción (! ), schemes to get her husband out of his clockmaker’s shop in order to receive a lover, at which point lover number two arrives. The two lovers hide themselves in large grandfather clocks, which are then transported, together with their contents, to and from the bedroom by a donkey driver. Eventually Concepción falls for the muscles and carrying power of the donkey driver. Well, well. And that was 1907. The performance of Maria Ewing as Elle was fantastic. French is not her mother tongue, but that was not evident. We tumbled with her from one emotion to another for forty minutes, in which time she conjured up a gamut of vocal sounds. When she sang of misery, throat closed, she was sometimes drowned out by the orchestra. A moment later, she was screaming hysterically and had the upper hand. Ewing was everything the piece needed. As Concepción, the French mezzo Marie-Ange Todorovitch was completely in her element. The rest of the cast were very good, with tenors Erik Slik (poet, 1st lover) and Steven Tharp (clockmaker), baritone Craig Verm (donkey driver) and bass Philippe Kahn (banker, 2nd lover). In the case of Tharp, his body movement was too young for the role. The music of Ravel makes a little jewel of L’heure espagnole, from the opening scene with the timepieces walking around each other. The orchestration is splendid and the Orchestra of the East took great pains to allow details and colour to be heard. The Reisopera combines two short operas about women with romantic problems to produce an entertaining presentation of maximum contrast. La voix humaine (1959) by Francis Poulenc is the tragic monologue of a woman going to pieces during a phone call to her departed lover. In Ravels’ comical L’heure espagnole(1911), the wife of a Spanish clockmaker has lovers galore. The soprano Maria Ewing, for decades a star on the world’s most important opera stages, makes a particularly strong debut in the role in La voix humaine. 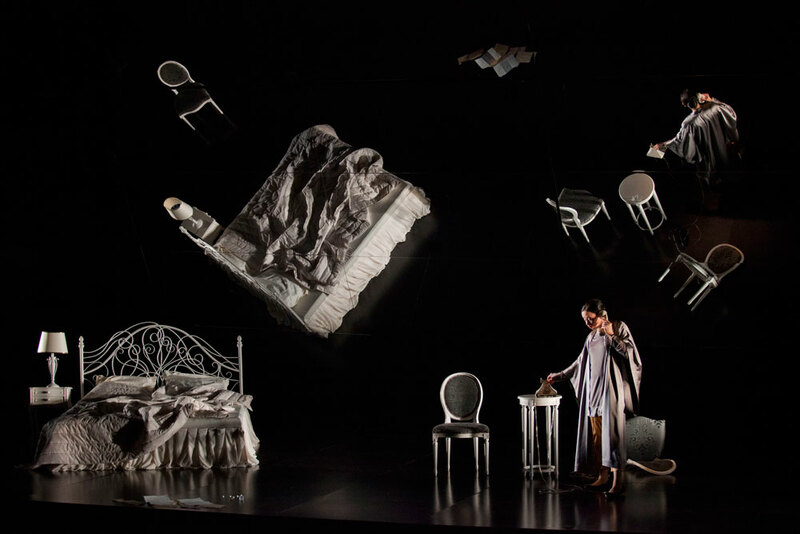 In the stage production by former tenor Laurence Dale, her expressive interpretation of Cocteau’s text acquires psychological, even psychiatric, dimensions. With a mirror as a back wall, her desperate telephone conversation is a confrontation with herself. Gradually it becomes clear that her monologue is the fantasy of a woman with separation anxiety. The presence of a silent, wraithlike lover on stage raises questions. What is reality? What is delusion? What is truth? The final tableau is a repeat of the start: a woman, apparently dead on the floor, ready to live out her misery once more. It is an oppressive, perpetual ritual in the style of Harold Pinter. In the burlesque L’heure espagnole, the lovers hide themselves in grandfather clocks. It’s funny, but it can be funnier.